Every year, screenwriters, filmmakers, actors, producers… all take the plunge, get on a plane and head over to Hollywood to ‘make it happen’. While some succeed, many fail simply because they just ‘didn’t know what they didn’t know’. Don’t fall into the same trap. Get yourself street smart before you hit the tarmac at LAX. Los Angeles remains the biggest, brightest, sexiest epicenter of western filmmaking, and the ONLY place where you really can walk in with a killer project and find yourself on the set of a multi million dollar studio picture. 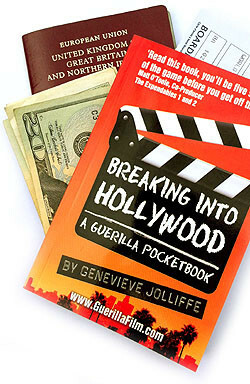 Guerilla Film author Genevieve Jolliffe has earned her stars in Hollywood – she moved over there, got an agent, manager, lawyer, pitched like crazy and ended up selling her screenplay to Warner Brothers. Success in LA is all about insider knowlege and strategy. Don't be a tourist. A really comprehensive, succintly written run through of everything you need to know if you're serious about breaking into Hollywood as a screenwriter or director. A clear description of the studio system and a particularly useful section on the differences between managers, agents and lawyers as in the UK we only have agents. Also great practical information on getting around, where to live, Visas. This isn't a screenwriting guide as it assumes that you're already pretty advanced at screenwriting or directing and are looking to break into Hollywood. Clearly written and incredibly useful. As a screenwriter planning a trip to LA in the next few months, this pocketbook is invaluable. I feel confident, prepared and knowledgeable about how the industry works and now have the tools to present myself in a way that will help me develop lasting relationships with producers, agents and managers. If you're thinking of going to LA you MUST buy this book first! 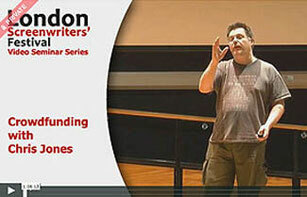 Going to Hollywood and writing screenplays - that's the dream, isn't it? It has certainly been mine for as long as I can remember. This book has given me practical, step-by-step advice and information on how to approach my first LA trip. I already had a working knowledge of the LA business, but I was amazed at how much of the details I didn't know. Don't expect the usual doorstep Guerilla Filmmakers book, this book is hyper targeted and designed to fit in your back pocket. For a small book the chapters go into surprising detail about the way the industry works and the channels taken into the various areas of it, be you actor, director, screenwriter, all of the above etc. and I know that if and when I do head to a city where I know relatively few people and have a lot to prove then having this in my pocket will be a source of succour and a reachable reminder of where my focus should be for those moments where I might feel less courageous, doubting of my abilities or just plain overwhelmed. Like the other Guerilla Pocketbooks before it it's a friend at your side to reassure you about what you've chosen to do. If you're interested in breaking into Hollywood, or even if you're just curious about what goes into US filmmaking and how it differs to the UK industry, this book offers a great "crash course", breaking down all the details for you; plus it offers great online resources for the reader, including seminars. A good value, clear and no-nonsense little tome. Recommended. An antidote to the deluge of War & Peace-esque books currently on the market. Unlike much of Hollywood, it gets straight to the point. Everything you need to know to get started plus some really useful insight from proper insiders. Definitely recommend it. If you're heading to LA to live the Hollywood dream then read this book first! It's probably going to answer the questions you've been asking yourself and, more than likely, many you should have asked but haven't. Straight to the nuts and bolts of living and working in LA from pitching to parking; negotiating to night life, representation, sales tax, visa requirements and the rest. I would thoroughly recommend it. I downloaded the Hollywood book and it is absolutely brilliant! For a know-all like me to say I learned so much, you can imagine how great it is! It is all-in-one, really, really, really brilliant! Please pass my congrats to the autho.